Before this first (short) week of the new year ends, I'd like to throw my One Word for 2013 into the blogosphere, as so many of my bloggy friends have done. I thought about this for a very long time. A whole day. My friend Andy has deemed 2013 the Year of Andy. To kick it off, he wore a Chewbacca shirt to work Tuesday. I've been thinking that for me, 2013 should be the Year of No. As in, I need to learn how to say it more often. And I need to start with volunteering. There's only so much of me to go around, so I need to trim some of my volunteer commitments, sadly. Because I still have that pesky full-time job and my darling children and husband who need me and my time, too. And let's not forget the writing career. Although I don't feel too bad saying no to the laundry. But really? Should no be the word that drives me this year? I considered drive, as in driven, motivated, persistent. But then I couldn't get the Cars song out of my head, which, although I love that song, I really don't need in an already cluttered mind. All year long. Then I thought I might cheat and go with let it be. Continuing along the Star Wars theme, I considered do, as in Yoda's quote: "Do, or do not. There is no try." Blue Cross and Blue Shield of Minnesota has a "do" campaign that encourages people to move their bodies to improve overall health, lose weight, etc., etc. Their commercials feature the word do with an endless number of suggested activities to get moving (and a guy with crazy-long arms). So I could attach any number of words to do throughout the year: do write. do revise. do create. The world is made by those who control their own destiny. It isn't made by those who don't do, it's made by those who do do. Which is what made me the man I am. I do do. Come on, this shouldn't be so hard, right? I considered love, as in all you need is (it's all about the Beatles). I considered imagination, spirit, mindfulness, peace, patience. I narrowed it down to two -- the first believe, as in Believe you can and you will, the topic of an end-of-NaNo post here. You know, I believe I will get an agent this year. I believe I will show these revisions who's boss. I believe I can fold all this laundry before the end of the football game. Sort of an if you build it, they will come attitude. Ultimately, I decided on balance, thanks in part to my husband, who played me a song last night from Balance, his favorite Van Hagar album (he's a Wings, not Rings kind of guy, which means he likes the David Lee Roth Van Halen better than the Sammy version. I am the opposite). The meaning behind this word is two-fold. Some of you may know that I have been dealing with vertigo for almost ten years. Even before the vertigo, though, I was a bit of a klutz. I trip, fall down stairs, break things (as in feet and toes). Balance (in the physical, bodily sense) can be elusive some days. As can life-balance. I'm terrible at achieving balance. I spend lots of time with my kiddos but not enough with my husband. I read ten books in one month but don't write a word. Or I write 60k and read one book (okay, yeah, that was NaNo, but....). I do everything at the last minute. I'm surrounded by clutter and chaos. Maybe it's a time management thing (okay, yes, it's clearly a time management thing). By saying no to some things, saying yes to others, by prioritizing, by planning ahead and using a calendar (what?! ), by taking care of myself in addition to my family, by writing down my goals, by slowing down, by de-cluttering, by breathing -- maybe, just maybe, I can achieve life-balance. One Word for 2013: Balance. 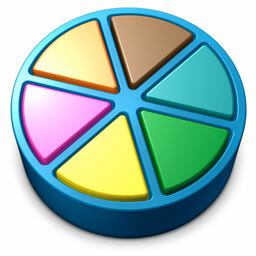 I've even got a visual reminder: the Trivial Pursuit pie. How about you? What's your One Word for the new year? Balance...I love it! I need more of that in my life, too! Great post! What a good choice--and well thought out. I need some balance this year, too. Great one. I like that there's a visual, too--clever! Nice. Yoga is a nice way to work on your balance - not just physically. Maybe a 1x weekly yoga class w/Mr Sara? Great post. Balance is a wonderful word and it does seem to encompass some of the other things you were talking about. Balance is a really good word, and I could use more of it in my life. I'm still thinking about my one word, but it will probably be something similar. I need to make some positive changes in my life and now seems like a good time to set some of those goals. :) I hope 2013 is good year for balance for both of us. Excellent choice in your word for 2013! We far too often try to attempt everything and often times neglect what matters most, because we just assume it will always be there when we finally get to it. Here's to a great year, Sara - I can't wait to see what happens for the both of us! Balance is a great word. I need to try for more balance in my life, too. Good luck in 2013!! Balance is something I strive for and have been failing miserably to achieve. You can do it, Sara. Happy 2013.